This page contains news and information about roads and highways in Pike County, Kentucky. Kentucky Atlas and Gazetteer: Pike County - Basic geographic and demographic information about the county. Kentucky Transportation Cabinet: District 12 - Based in Pikeville, district twelve serves Floyd, Johnson, Knott, Lawrence, Letcher, Martin, and Pike counties. Kentucky Transportation Cabinet: District 12 Planning Projects - Reports and maps from the Division of Planning concerning projects in district 12. Kentucky Transportation Cabinet: Scheduled Public Meetings: District 12 - Schedule of any upcoming public meetings in Pike County. PIKE COUNTY – February 14, 2011 – Work is under way on the mega-interchange that will connect new US 460 to US 23. Bizzack, the state’s successful bidder on the project, moved onto the Sookey’s Creek site today to begin construction on what is estimated to be a two-year project. The Kentucky Transportation Project says a project to prevent rock from falling onto US 23 south of Pikeville has been successful. A fence was installed to catch falling rocks. Heavy rains in June washed out several roads in far eastern Kentucky. Damage was so severe the Transportation Cabinet Highway District 12 was forces to halt all routine highway maintenance and refocus on emergency road repairs. Preliminary estimates are that repairs will cost $6 million. The rain and floods also damaged roads in Clark County. Additionally, the rains are believed to have contributed to the partial collapse of KY 292, the Huntley-Brinkley Road, along the Tug Fork in Pike County. The road was constructed by local residents nearly 40 years ago. After the area was featured on the NBC evening news with Chet Huntley and David Brinkley, television viewers nationwide sent donations to aid in the construction of the road. Local residents believe heavy coal trucks contributed to the collapse of the road. Transportation Cabinet District 12 reports that construction on the first phase of the US 460 widening project in Pike County is 53% complete. The 2.3 mile section of highway begins at US 23 and climbs to the top of a mountain to the east. This section of highway includes a set of twin bridges that carry the highway 86 feet above a mountain valley. The entire project between US 23 and the Virginia state line is expected to take up to 12 years and cost $500 million. Two years after being cited by the Transportation Cabinet for delaying work on a road connecting US 23 and the Pikeville airport to illegally mine coal along the road's right-of-way, Elmo Greer & Sons of London has been fined $125,000. The company had been allowed rights to any coal uncovered during the construction of the road; however, Greer has been found to have illegally mined coal from a 40 acre waste area along the 2.7-mile road. A public meeting for I-66 planning in Pulaski and Laurel Counties brought out several anti-I-66 groups. The Transportation Cabinet is conducting a study to determine the route for I-66 between London and Somerset. This will replace the two-lane KY 80, the current major east-west corridor in the region. Meanwhile, U.S. Congressman Hal Rogers has used his position on the transportation appropriations subcommittee to have money for Southern Kentucky road projects included a draft version of the Fiscal Year 2004 Transportation Appropriations Committee. The money includes $4.5 million for continuing work on designing I-66 in Pulaski and Laurel Counties, $2 million for I-66 in Pike County, $2 million to improve US 27 north of Somerset, $1.5 million for widening I-75 in Rockcastle County, and $1 million to fund the reconstruction of the Hal Rogers Parkway between mileposts 33 and 47 in Leslie County. The Final Environmental Impact Statement for the Pike County, Kentucky and Mingo County, West Virginia segment of I-66 has been approved by the Federal Highway Administration. This means that the project now moves to the final design phase which will be followed by right-of-way acquisition, utility relocation, and construction. The KY 1384 overpass over US 23 in the Pikeville Cut will be renamed on Monday, according to the Appalachian News-Express . The bridge is currently known as the Masten Childers Bridge; on Monday the name of the bridge will be renamed the Velma and Masten Childers Bridge. This bill adjourning the Kentucky General Assembly (word document) on the occasion of Velma Childer's seventieth birthday on Jan. 24, 2000 contains some biographical information about Childers. A proposal to build a bridge near the 1,600-foot deep gorge in Breaks Interstate Park has stirred up opposition. The proposed bridge would allow access into the Kentucky side of the park; however, the bridge which would connect the park to KY 80 would be visible from overlooks over the gorge in the park. Currently all of the development in the park has been on the Virginia side because there is no road access to the Kentucky side of the park. The primary feature of the park is a 5-mile long gorge through which the Russell Fork of the Big Sandy River flows. The gorge is touted as being the deepest canyon east of the Mississippi. Residents fear that the bridge would open the park to commercialization. The Kentucky Transportation Cabinet is installing high-strength fences along some highways in Eastern Kentucky to limit the effects of rock falls. The fences are designed to catch falling debris and prevent it from blocking the road. These fences have already been installed along a section of Kentucky 1274 in Menifee County and are being installed along a section of US 23 in Pike County. Rock falls are common along highways in Eastern Kentucky. Recently, a rock fall on KY 1460 closed the highway for two days. A transportation cabinet highway planner, Keith Damron, reports that construction of a segment of I-66 in Pike County could begin next year. The actual beginning of construction is dependent on final federal approval by the U.S. Department of Transportation and available funding. This section of I-66 is about 30 miles long and would begin at US 23 in Pikeville and extend to the West Virginia border. This road is expected to cost $1.5 billion (or $50 million per mile). Interstate66.com reports that public meeting about I-66 have been held in the Pike County area. Maps from the meetings can be found here . The KYTC is studying the possibility of building a bridge over Pond Creek Road in Pike County instead of the nearly 300 foot high embankment that had been considered. Local residents presented the KYTC with a petition after concerns were raised over the impact the new road would have on the accessibility of the valley. The new bridge proposal will be discussed at a public meeting scheduled for March 18. See www.us460online.com for more information. Two public meetings will be held to discuss the I-66 project in Pike County, Kentucky and Mingo County, West Virginia. The meetings will be held on March 25 and March 26. See Interstate66.com for more information on times and locations. The KYTC will be holding a public meeting Thursday, February 6 at 5:00 pm in the commons area of Pikeville High School. The meeting is to discuss the US 23 Congestion Relief Project. A recent spate of fatal road crashes in Eastern Kentucky has caused the KYTC to put a greater emphasis on seat belt usage. During an eight day period in January five people were killed in five separate accident. None of the five were wearing seatbelts. Those wearing seatbelts in the accidents survived. More information can be found at the Appalachian News Express (no longer online) and the KYTC web site . The governor has declared February as Buckle Up Kentucky Month . According to US460Online.com (a KYTC website for the project) a proposed interchange at Wolfpit has been eliminated from plans for US 460 in Pike County. This will reduce the cost of the project and reduce the number of families which must be relocated. Right of way acquisition is scheduled to begin in the spring. The Interstate 66 web site now has the Fall 2001 Newsletter (PDF format) detailing progress on plans for the Pike County segment of I-66. The KYTC has posted materials from an August 30, 2001 meeting regarding I-66 between I-65 and the Natcher Parkway here . Interstate 66 - Division of Planning - Contains links to materials from I-66 public meetings. Interstate 66 - Somerset to London - A complete report detailing the proposed route from Somerset to London. This would connect the Nunn Parkway to the Daniel Boone Parkway. Interstate66.com - Contains information about Interstate 66 in Pike County, Kentucky and Mingo County, West Virginia. 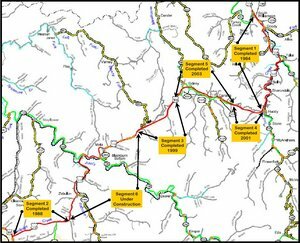 The KYTC has posted the most recent maps of the proposed alignment of I-66 in Pike County, Kentucky and Mingo County, West Virginia. They are available here . A questionnaire can also be downloaded from the same page.